Sometimes what makes already amazing songs even better is knowing the story and people behind the music. With the group Staff Benda Bilili, this is most certainly the case. 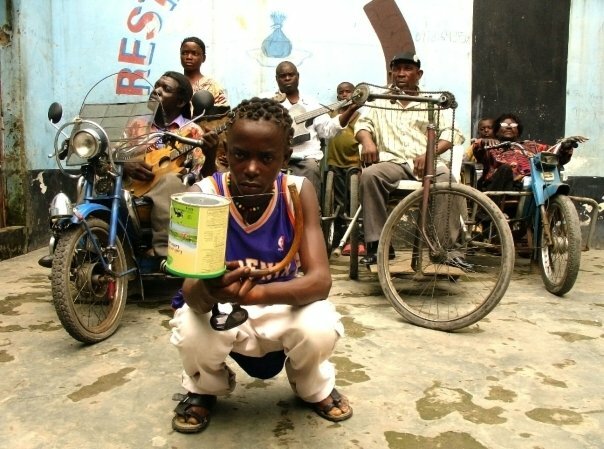 Staff Benda Bilili is a group from the streets outside of Kinshasa's zoo in the Democratic Republic of Congo. The group is made of four paraplegic singers and guitarists on their customized tricycles, a group of younger acoustic rhythm section, and a 17-year old who plays his one-string electric lute he constructed himself out of a tin can. Their songs, like all music from DRC, are infectious. DRC rumba rhythms are obvious and there are hints of reggae and occasional Cuban beats all of which combine to create a traditional yet progressive sound. They released an album titled Très Très Fort in 2009 and their new album, Bouger le Monde, is set to be released this Monday (September 3, 2012) on iTunes - so be sure to check it out!